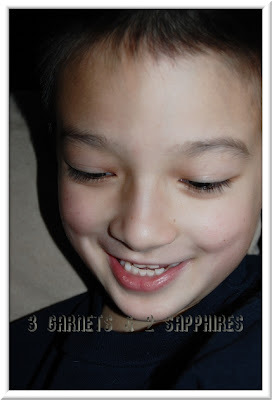 3 Garnets & 2 Sapphires: Silly Monkey Stories: Hold This Please? 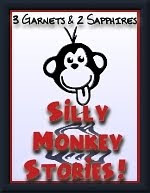 Silly Monkey Stories: Hold This Please? Our son is 7-1/2 year old and he has yet to lose a tooth. Some of his friends have lost several already. He does, however, have 3 or 4 loose teeth. One of them has been loose for many many months and our son is anxiously waiting for the tooth to fall out so that the Tooth Fairy can pay him a visit. The other day, he told me that he thinks he has another loose tooth. He was trying to wiggle it with his finger, but could not be certain. Being the avid problem-solver that he is, he said to me: "Can you hold my head? I need you to hold it still so I can see if my tooth is moving."